Another day, a familiar feeling of foreboding. Or seize the day, the promised land will be delivered. Mathematically, Scotland still cling to the chance of winning a play off spot for the chance to win a spot in Euro 2014. Mathematically, I could probably measure the height of the trees outside my window using trigonometry. I’m not going to though. So we’re only two games away from the fevered anticipation of a play off draw. Or two games away from the doom, the gloom, the post mortem and the calls for Craig Levein to fall on his sword. First though comes part one of a double header that is probably just the wrong side of a mission impossible to qualify as being "crucial". Today Liechtenstein. Little Liechtenstein. A small, hilly country where the tax is low and the drink is costly. Narnia, Aslan Salmond calls it. There are, they say, no easy games in international football. That’s not true. Spain have scored ten past Liechtenstein in two qualifying games. There are easy games. But there are fewer easier games for world football’s lumpen proletariat than there are for the aristocrats. And Scotland are scrapping among the peasantry. Spain apart, this is a desperately poor group. Scotland needed 96 minutes to despatch Liechtenstein at Hampden. Lithuania beat Czech Republic away. Liechtenstein enjoy a better record (on goal difference) against Lithuania than Scotland. Scotland now appear to have a problem adjusting to those moments when we lift ourselves free of the shackles of our ordinariness. We display a timidity in moments of superiority that we often don’t suffer when the game’s giants are trying to oppress us. So we roar back against Spain yet slouch into the shadows when in front against the Czechs or dominating the Lithuanians. That means we often lose or draw games we could have won. And we still end up losing game we’re expected to lose. The worst of both worlds. Emboldened and ready for revolution when faced with the aristocracy, unable to assume command among the squabbling under class. All of which can create big problems when we play a team like Liechtenstein. A country even smaller and less successful on the pitch than ourselves. A team who see Scotland as a scalp and will happily set out this evening with the same intent that we’ll be planning to show in Spain next week. Their desire and our timidity. It can be a disappointly nervy combination. It’s not arrogant to suggest we’re meeting minnows tonight. 80 times Liechtenstein have played qualifying matches for major tournaments. They’ve lost 67 times, drawn eight and won five. They’ve conceded 254 goals and scored just 32. Are they improving? Maybe. Maybe not. Discount those easy Spanish victories and they’ve conceded just six in five games. But they’ve only scored three and – we hope – are set to finish bottom of a qualifying group yet again. That’s not to point and laugh at the little “made up” country who have no right to be playing with the big boys. They showed at Hampden that they more than have that right. It’s to emphasise that, while offering them every respect in our preparation and attitude, this Scotland team, any Scotland team, should be able to beat them. This evening, with those slim hopes still alive, we have to beat them. And yet still there’s a hint of fear in some of the pre-match chat. Apoplexy over Darran Fletcher’s tonsils and Kenny Miller’s leg, concern that our centre backs might not be up to the job, debate over whether the inclusion of Charlie Adam is a luxury we can afford to risk. It seems that Fletcher has declared himself fit but Miller won't feature. Captain ready, vice-captain missing but the formation unchanged. Tried and tested. The nucleus of Levein's group on the field and prepared to offer their all. Is that the best tactic, to stick with what we know? It’s all we’re going to get from Craig Levein. He won’t though. When you’re not in the top tier, your football is always likely to be as risk averse as it is adventurous. If, as I expect, we’re out of Euro 2012 by next week then those who call for Levein’s head should remember that very few available managers are likely to offer us anything other than blood, toil, tears and sweat. Whoever plays, whatever the formation, we’re in Liechtenstein to get a win that will keep the pressure on Czech Republic. If we can’t do that then not only do we not deserve a play-off spot but we’re destined to slum it with the also-rans, nearly men and never-has-beens for a long time to come yet. Liechtenstein’s national anthem is sung to a tune by an unknown composer that has been popularised – or demonised – by its association with God Save The Queen. Countries often borrow things from other countries. There are nations in Africa with agriculture laws that make provision for farmers in Northern Ireland and crofters in Shetland. Admittedly it’s not the best tune in the world. But the playing of the anthems before an international football match is not the natural home for informed musical criticism. More than just musical criticism? So what are we left with? A small country feels victimised by a larger country so picks on an even smaller country in act of misplaced retribution. There's something rather depressing about that. A name worthy of echoing down the decades. And Scottish football can boast two of them. Both with a tale to tell. Barney Battles Senior played for Celtic, Liverpool, Dundee, Hearts and Kilmarnock and was capped for Scotland three times. In 1896 he went on strike at Celtic because he'd been criticised by a number of journalists. It seems a wonderfully modern reason for withdrawing labour, confirming that football today doesn’t have character enough to even harbour original grudges. Tragically Barney Battles died in 1905 at the age of just 30 when a bout of ‘flu developed into pneumonia. Some months later Scotland played Ireland at Celtic Park and the gate receipts were donated to his pregnant wife. That October she gave birth to a son. She named him in tribute to his father. Scottish football's second Barney Battles was born. But the game in his homeland would have to be patient. The younger Barney attended Edinburgh's Holy Cross High School, since amalgamated with St Andrew’s Junior High School into St Augustine’s, before his mother decided the family would enjoy a better life an ocean away. And so a teenage Barney found himself in Boston. Perhaps not entirely predictably he discovered an America that offered him the ideal place to launch his football career. The game has often enjoyed sporadic booms in the States but lacked sustainability. The early 1920s was a boom time as the American Soccer League made inroads in the north east of the country. Immigrant communities offered talent and supporters, industrialists offered sponsorship. Barney was in the right place at the right time. He impressed with the Boston Celtics and then, at the age of 19, was offered professional terms with the Boston Soccer Club, known as the Wonder Workers. In his first season he was something of a scoring sensation as the club won both the Lewis Cup and the American Professional Soccer Championship, a mash up competition between the ASL and the older St Louis Soccer League to determine which team could be considered national champions. He scored both home and away in a two legged decider against the Ben Millers. International recognition was immediate. Battles was picked to play for the United States national team against Canada in Montreal, the hosts winning 1-0. He continued to impress as the Wonder Workers performed consistently in the ASL and finally landed the championship in 1928. But by the late 1920s the ASL - which had contributed to soccer becoming America’s second largest spectator sport - was splintering. The economy was careering towards the misery of the Great Depression. Willie McCartney, who would later cross the city and become the architect of Hibs’ Famous Five, had taken over from his father as Hearts manager in 1919. Hearts remained a big club but throughout the 1920s they had struggled to recover from the sacrifices their great pre-war team had made during the First World War. The manager liked what he saw in the 23 year old Battles. A £9 a week contract was signed and - a tribute to either his celebrity spreading across the Atlantic or because of his famous name - 18,000 turned up to watch him make his debut in what amounted to a match between Hearts and Hearts reserves. His first competitive game was at Hampden against Queen’s Park. Not a bad homecoming for a footballer. And a fine place to score a first competitive goal for a new club. A goal in his first game, two goals in his second game and three goals in his third game. The young Barney had a certain flamboyance. What standard of football had he been playing in the States? If his return to Scotland involved a step up in class he didn’t let it show. He scored 31 goals in 28 league games that first season. In the local cup competitions that used to round off the Edinburgh football season he scored a scarcely credible 11 goals in just three games against Hibs. 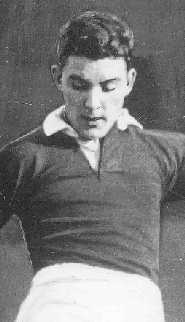 Across all competition he scored 68 times, including five in a league representative match against Ireland. I’m not an expert on the feats that build a Tynecastle legend but he must have been getting pretty close. He scored 26 league goals the following season and another seven on a Scottish Cup run that was ended by Rangers in the semi final. He also scored another four for the Scottish League side. In one game. Against Ireland. Again. How to top that? Barney had an answer. In 1930/31 he missed some games with appendicitis, scored hat-tricks in three straight games and ended up with 44 league goals. Hearts finished fifth that year and scored 90 league goals. Barney came very close to contributing half of that tally. This was a striker playing something close to fantasy football. Even Scotland’s infamously rubbish selectors had to pay some attention. They did. Amazingly though they chose to give him his only cap right the start of his annus mirabilis. 25th October 1930. Scotland v Wales at Ibrox. A 1-1 draw. Inevitably Scotland’s 42nd minute goal was scored by Barney Battles. It was to be his only Scotland cap. He had a goal a game record. To offer those maligned selectors an olive branch of understanding it is important that they preferred to pick Hughie Gallacher throughout Barney’s Tynecastle pomp. Gallacher, of course, had an international goals to game ratio of 1.15 across 20 caps. Sadly, just when it seemed nothing could stop Battles at club level, a knee injury proved more troublesome than his appendix. His appearances for Hearts became more sporadic. Over the next four seasons he retained his goalscoring ability but the fitness to enjoy a sustained run in the team eluded him. “What would the Hibs or any other do with a player who because of some physical handicap was liable to let them down in the course of the game? Journalism followed. He opened an eponymous pub in Newhaven - the boy born in Fisherrow who conquered football on both sides of the Atlantic drawn to the coast again - that lives on in the memory of locals of a certain age. Two international caps for two different countries. And a goalscoring record at Hearts that would have left his father, the doughty defender he never knew, awestruck. Forgotten Scotland Players number 8: Barney Battles Junior, Hearts. 1 cap. According to the papers, the Scottish Football League will examine the attendance at the Partick Thistle v Greenock Morton match in its trial slot of Friday evening, against last season’s equivalent Saturday fixture as a measure of whether to extend Friday night football to other matches. This looks to be a shoogly peg on which to base any theory, given that football attendances are all over the place, for all sorts of reasons, many weather related and most based on the amount of cash rattling around in supporters’ pockets. A higher attendance at this match looks (at the time of writing), to be a bit of a nap bet. It’s payday, the weather’s great, it’s something new and interesting (until it becomes tedious and mundane), Morton are at the top of the league, Thistle are playing attractive football and so on. So I’d be willing to bet that Mr Longmuir will be in Monday’s papers telling us all about the success of this trial run and rubbing his hands at the prospect of more Friday games between the likes of Hamilton Accies and Livingston, both of whom have expressed interest. Now I’m no expert, but I reckon that if you used Mr Longmuir’s example of empirical evidence to measure the speed of a neutrino, you’d not exactly be in the running for a Nobel prize in physics. Would it not be more scientific, more fair in fact, to ask the supporters what they think of the idea? I have to admit a vested interest. As an Edinburgh based Jags fan, this game is a monumental pain, but I will always try my best to follow the team, regardless of where and when they are playing. By going to the game, I’m helping to confirm Mr Longmuir’s view that fans would like this change. Talk about turkeys voting for Christmas? The subtext is that the SFL are trying manfully to grab more of BBC ALBA’s football budget and like a pushy parent, they are prodding Thistle and Morton towards centre stage as an example of how great a live SFL match could be for ALBA’s flagging figures. It’s all about money of course, and whilst folk like me moan and gnash their teeth, the SFL will have their day, the club boards will get their TV money and another nail will be battered into the coffin of Scottish football. On the upside, at least I’ll get a decent curry before the game.